When the best of what's old becomes new again. Our Founders' 1919 Collection. Our traditions excite new appreciation for fine cheese and offer you hand-tended cheesemaking at its slowest and most artful. Brought to you by the farm families who own Cabot, we give you the Founders' 1919 Collection: Orne Meadows, Private Stock, Adirondack and Lamberton. ORNE MEADOWS CHEDDAR, 6 oz. - 4 x 4 bar - A smooth Alpine style with a subtle, sweet nutty finish. Perfect for slicing and pairing, and it's robust, sharp cheddar flair is delicious with muted crackers and warm breads. With a subtly sweet fruity and nutty finish, Orne Meadows is also a tasty choice for your next wine and cheese gathering. ADIRONDACK CHEDDAR, 6 oz. - 4 x 4 bar - This cheddar packs that distinctively tangy "Upstate" bite that sets it apart from other New England cheddars. It carries hints of grapefruit and bergamot within a crumbly texture that still feels creamy and smooth. The creaminess of this cheese gets even more pronounced as it warms to tasting temperature, making it an ideal selection for a cheese board or fruit tray. LAMBERTON CHEDDAR, 6 oz. - 4 x 4bar - English-Style with caramelized notes and buttery bite. A traditional British-style cheddar, boasting a smooth, buttery undertone to its caramelized, sharp tang. Try alongside crisp, wet fruits like pears or red grapes. PRIVATE STOCK CHEDDAR, 6 oz. - 4 x 4 bar - A savory extra sharp masterpiece aged to perfection. It is sure to deliver the signature "Northeast Bite" you expect from Cabot alongside a subtle, buttery smooth texture. Nice assortment of cheeses for a small group gathering. Package sizes are just right for making up a platter with accompanying crackers and spreads. Variety of flavors, each one having its own unique character. 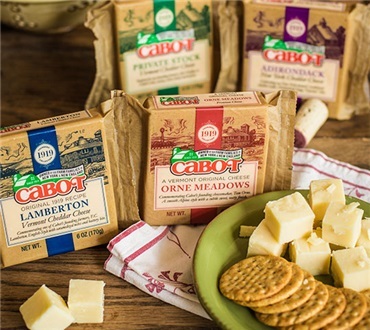 I am a cheese lover and visited the Cabot store while visiting Vermont this past November. I fell in love with the Orne Meadows cheese while sampling there. I left the store with 45.00 worth of cheese and ended up visiting Dakin Farms website to purchase 4 more blocks of the Orne meadows cheese because it is not sold 8n my area here in Massachusetts. Truly the best tasting cheese! These make great gifts with a bottle of wine, or just to bring to a party or gathering. People always comment on how delicious they are.